I am so very grateful to have had the opportunity to be sponsored for the 2011 PeaPod Half Madness 13.1 (HERE) in Batavia, Illinois. I ran the race as my second half marathon, back in 2008, when I was training for the Chicago Marathon (my first full). It was a great experience in 2008 .... and an even better experience in 2011. I am so thankful to have had the opportunity to participate again. I cannot say enough about the race and the communities of Batavia (where the race was held) and St. Charles (where I stayed). Half Madness also did a fun Q&A Session with me (HERE). 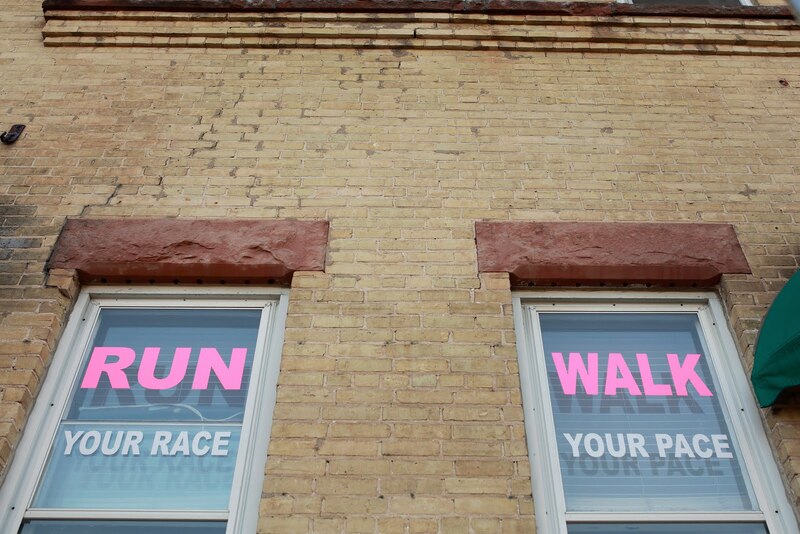 Packet pick up was in downtown Batavia on Saturday. I parked right at the cute little park downtown and was one of few people at packet pick up on Saturday afternoon. I grabbed my packet, my bib, a technical tee and a water bottle. I got to bed at a somewhat decent time on Saturday night and was up at 5:15 am for the 7:00 am race. I took my time getting ready, had a yogurt, an energy bar, and headed from St. Charles to Batavia. I parked at the same park, near packet pick up, used a solo port-o-potty, and walked a couple of short blocks to the start line. I hydrated a bit and took a gel before heading to the port-o-potty lines. There were about a dozen availalbe and with 20 mins to go til race time, I was about 10th in line. The national anthem was starting and I headed to the start line. The course started a few blocks away from where I did in 2008, due to another event going on. And the course was going to be reversed. I ended up liking it much better than the original course. The only part I'd complain about was the first half of mile, when we ran behind a sewage treatment facility and everyone was complaining about the stentch, and then we followed that by a decent incline up hill. Otherwise, the course was pretty awesome. There were a lot of photographers scattered out on the course ... several in nice locations by the river or on the gorgeous bridges (I love running across bridges!). This photographer captured my new favorite race photo. Thank you! We traveled through residential neighborhoods on foot and the water stations were spaced every 1.5-2 mi from what I recall. They had red Gatorade (which I really appreciated, since I HATE the nasty lemon lime flavor that most courses offer) and water available at every aid station. I carried my handheld water bottle, but actually drank the whole thing half-way through, and had a young lady dump two cups of water in my bottle, to fill it back up. I grabbed Gatorade at every water station along the way, too. The course had very few hills the first seven miles, except for that one at the sewage treatment facility at the start. Around mile four we ran down a step hill towards the downtown area, where there was a lot of crowd support. It was exciting and I picked up speed, as we headed along the river on the gorgeous running path. As we passed the crowd, some guy passed me and said that he had to comment on how my outfit was the best on the course. 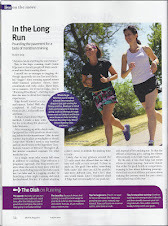 I heard this several times from other runners and several spectators and volunteers loved the matching skirt and purple compression socks. I always smiled, said thanks and added a little extra bounce to my step. 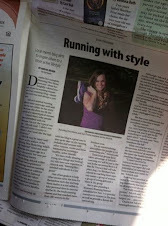 I loved sporting my purple 13.1 Bondi Band, too .... as I ran my 13th 13.1 distance run of the year. After we passed the crowd, things got pretty quite along the river. It was so nice and the sun was shining (annoyingly in my eyes at times, but nice) and such a beautiful morning. A great day to race! I loved the shade from the trees, the sound of the water, the gorgeous bridges we ran over. We ran through more residential neighborhoods after miles 7 or 8 and up a pretty steep hill. I lost steam for a bit and then took another gel. I gained some energy and sipped on my water bottle. There was an an aid station with sponges and another with energy gels in the second half. The last couple of miles we turned right on a nice shaded path that would bring us to the finish line. I picked up speed the last mile and could hear the announcer calling everyone's names ... I knew I was close. I passed over one last bridge and veered towards the finisher's chute. And, then my name was called. I picked up speed, pumped my arms and made some really ugly faces. I wasn't going to PR, but I knew that I had a great finishing time ... I believe this was my third fastest half marathon of them all over the past six years. I grabbed several yummy beverages, including Diet Pepsi, bottled water, organic chocolate milk and then headed to pick up some grub (my second of three breakfasts of the morning -- the third being the complimentary breakfast back at the hotel!). I really enjoyed the variety of bagels from Panera Bread, which included my favorite Cinnamon Crunch! I also grabbed my favorite after long-run fruit (oranges) and some energy bars for later. They also had some pizza which I didn't take and some other goodies. The medal was MUCH larger than what I received in 2008 and more artistic. I had the absolute BEST experience at this race and definitely want to go back for a third time. With just over 1,000 finishers, it was a really nice mid-sized race that wasn't too crowded, but just as exciting as the larger races I've participated in. I spent the rest of the day touring St. Charles and the gorgeous downtown area along the river and the wonderful park. I found a cute sweet shop and indulged in a cupcake before I headed back to Wisconsin. I definitely would love to take my kids back to the family-friendly destination. Half Marathon #13 of 2011 D-O-N-E!!!! 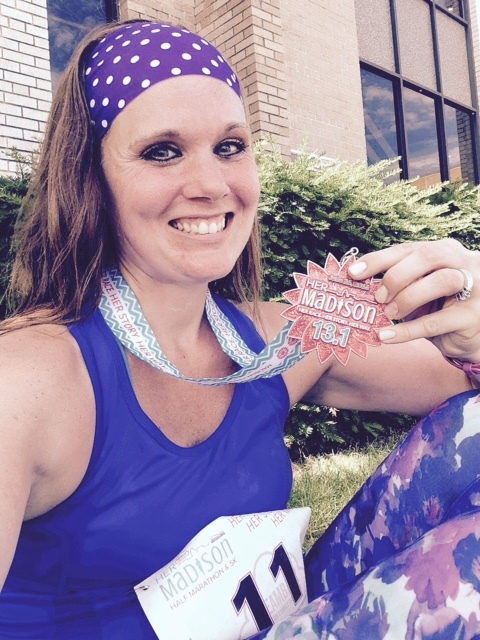 This past Saturday, I ran my third Madison Mini Marathon (HERE). 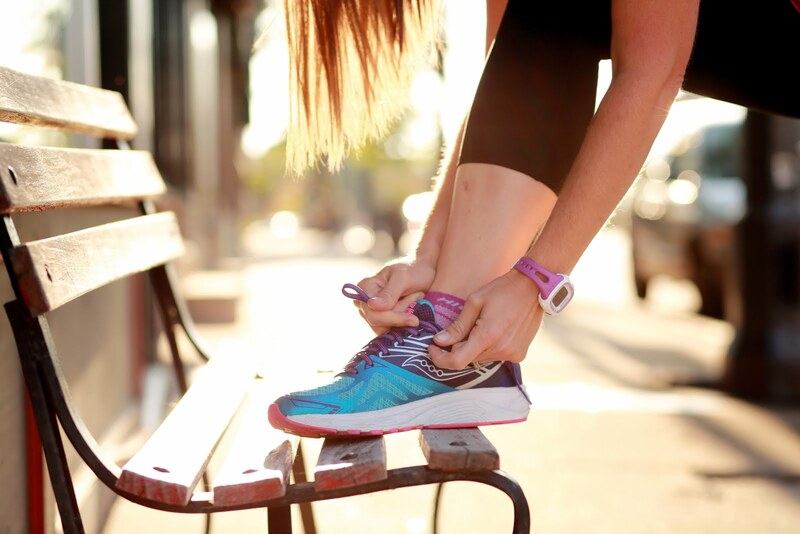 The 13.1 mile journey takes runners through the University of Wisconsin, State Street, Zoo, Arboretum and back along the lakeshore path to the UW Memorial Union. It's beautiful, scenic ... and fun! The kids and I headed to the Unions South on Friday night for packet pick up. Parking was avaialble for expo attendees in a parking ramp nearby and packet pick up was a breeze. It was a small expo, but it's always nice to be surrounded by new products and like-minded people. We received a decent technical tee. I loaded up in the marathon Mommy Minivan at 5:45 and headed to downtown Madison. I parked easily in the Lake Street parking ramp (ended up costing me $5). I grabbed my things and headed to the nearest porta-potty. I headed down to the end of State Street, and there they were ... plenty of porta-potties near the Memorial Union. The set up was a bit different from years prior, because there is significant construction going on by the Union. After using the bathroom, I headed back towards the UW Bookstore, where I was hoping to meet up with some bloggers and friends. I ended up connecting with "Dan the Man", who I met on the Haunted Hustle Half Marathon race course last October. I had ran with Dan, as he struggled (just a bit!) during his first half marathon last fall and we've kept in touch ever since. He drove several hours to come back to Madison for this race, and to spend time with family. We caught up, and I ran some items back to my minivan. Upon returning, I ran into Jen (aka Badgergirl) (HERE) who I met at Oshkosh Half Marathon last year, and who won a race entry to the Mini on RDM. 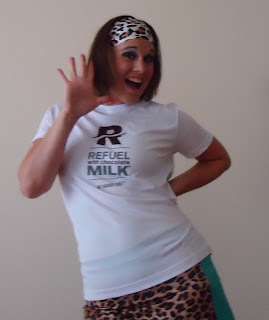 Jen was also running as a member of the Refuel with Chocolate Milk Team, so I gave her her gear, we said a few quick hi's, and then we both headed off to do our pre-race rituals. Dan the Man and I headed to the porta-potties once again and then to the start line, for the 7am start. Once the 3,500 runners got to the start line, the sky was getting dark and darker. Then wind started picking up a bit and the announcers said that they were delaying the race, due to severe weather. We were all encouraged to seek shelter in the Red Gym and the Memorial Union. I joked with Dan that this would be good blog material, as we headed over to the Red Gym. It was extremely hot, muggy and congested inside, so we stood outside with a few dozen runners on a patio and watched the storm roll through for 90 minutes. By then everyone had to use the bathroom again and had to refuel. Everyone was darting to the porta-potties in the rain and grabbing armfuls of bananas and granola bars and rice crispy bars for their friends. We did the same. I had taken a gel with caffeine before the race, but it had already worn off. At the Red Gym, I also ran into sweet Miss Kerrie from Tutu Runner (HERE). She looked super cute, as usual, in her TNT gear. I was bummed not to have my camera with me. During our time standing around, Liz, who organized the Refuel from Chocolate Milk Team (HERE) recognized me, and came over to introduce herself. After an hour and a half, we were all back at the start line. It was still raining, but the lightening had stopped. I got pumped by "Thunderstruck", that was playing loudly as the timer started ticking. I was pumped and ready to run. It rained for the first four miles, until we were almost to the Henry Vilas Zoo. I was soaked, my feet were soggy (there was no avoiding puddles) and I didn't even WANT to know what my mascara had done to my face. The sun came out immediately, as I entered the UW Arboretum. I was worried it might get hot, muggy and humid ... but it didn't. Dan and I were still running together for the most part, but I could tell I was holding him back. I told him to take off if he wanted, and we eventually lost eachother throught he Arb. I carried my handheld water bottle with me and a gel packet. I ended up finishing the bottle and the gel by the end of the race. There were plenty of aid stations along the course and I took Gatorade (icky lemon lime) at every stop. I liked how they had the Gatorade placed before the water at the aid stations (something different than I've seen). Volunteers were awesome and were clear about what was what and the cups were clearly marked. I don't believe there were gels at any of the aid stations. Coming out of the Arboretum, we headed past the golf course, where I saw a co-worker. I called out his name, since he lost me in the see of people. He had brought his camera and caught this actions hot. We headed down Monroe Street, past Camp Randall Football Statdium and towards Lake Mendota and the Lakeshore Path. At the Lakeshore Path turnaround, and about mile 11.5, I saw Chelsea from Early Runner (HERE), who snapped this action shot. It was no longer raining, but I was soaked! I felt great as we ran down the Lakeshore Path towards the Memorial Union. The crowd support at the finish line was great and I sped up to cross the finish line in just over 1:56. Not a PR, but I was SUPER happy with my time, especially since I've been significantly slower lately and because of the delayed start that morning. I could not find Dan or my other friends after the race. But, I did Refuel with Chocolate Milk, a Diet Dew, and grabbed a banana, granola bar, rice crispy treat and Fritos to share with the kids later. Dan called me later, to let me know he got a fantastic PR for the day and looked forward to racing together again at this year's Haunted Hustle. Earlier in the month, I headed out for an easy 6 miler on the Capital City Trail after work. I enjoyed taking in the beautiful Tuesday evening on foot through Fitchburg and Madison's south side. After some stomach cramps subsided, I got in tune with my breathing and my footwork and alone with my thoughts and felt great. Instead of turning around at mile 3, I kept on past the six mile marker and then headed back. When I returned to my starting point, I had completed another 13.1 mile journey ... my tenth of the year. On a perfect Sunday morning last week, I headed to the Glacial Drumlin Trail for a coaching session. Knowing I had to get in a long run, I planned to meet my friend, Mandy, three hours early for a speedy twelve miles and then some solo miles on my own. We had great conversation out on the trail and updated eachother on what has been going on in our lives since our last run. Conversation went so well, that the six mile marker came super quickly, as we had to turn around and head back. It was another fantastic day for running and we completed twelve fun miles together. After chatting and laughing (and hydrating) for sometime, I headed back out for a few more miles on my own, before my clients showed up. I finished half marathon #11 before heading out to motivate them. They cheered for me as I ran into the parking lot ... I LOVE all of my clients! They promised me a bloody mary when I got there. I didn't get that, but I got some high fives and great hugs! The three of us decided that we would focus on distance rather than time. With a 25 minute training run on the schedule, we decided to try to reach the one mile marker and head back to complete a full two miles that morning. And, they did it. It was awesome to see them get so excited about mixing things up a bit and all that they had accomplished that morning. After running some additional miles on my own, I finished a full twenty miles for the morning. It was such a nice combination of running with a friend, encouraging others to finish and follow-through, and spending some time alone with my thoughts. Life is all about balance. It's been awhile since I've reported on a date with Little Diva, well, because I haven't had the opportunity to do so. Since I'm only with the kids half of the time, I find it difficult to give up the Little Dude in order to spend some alone time with her. But, recently I found it necessary for both of us and her dad offered to let her spend part of last Saturday with me. These dates give us the opportunity to spend time together, to do things that we wouldn't do on a normal day with the Little Dude (who can be quite a handful at times!) and be girly! 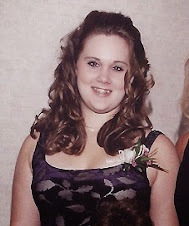 We started off at the hair salon, where we caught up with my hairdresser and I used a coupon for a much needed haircut. Then we headed to the mall, where Little Diva used a gift card to a jewelry store. I forgot that Santa left it in her stocking. We enjoyed digging through the racks, and finding some treasures .... including these awesome Mother/Daughter necklaces. I love that we each will have half wherever either one of us is. We also splurged on an oragami set and magazine at the book store. Then we headed over to Olive Garden to use a gift card to Olive Garden. It's also been burning a whole in my pocket since the holidays ... and this was the perfect time to use it. Little Diva LOVES salad and can't get enough black olives. Little Diva also had a gift card to the local pottery store. We've been there several times and she was so excited to pick out some new pieces to paint ... she chose a horse and an elephant. I didn't purchase a piece for myself this time, because of my tight budget and the gift card just covered her two pieces. The sweetheart gave me one of her pieces to paint because she wanted mommy to have fun, too. We then headed down the street to a local Cupcakery to splurge on some yummy cupcakes. No gift card or coupon was needed for this splurge!!! It was so great to reconnect one-on-one with my Little Diva. It's been far too long since we've had alone time. .... And Little Diva is one cheap date!!! I was recently given the opportunity run the Madison Mini Marathon as a member of Team Refuel with Chocolate Milk (HERE). Last Saturday, July 30, I ran the 33rd Annual Waunafest 10 Miler in Waunakee, Wisconsin (HERE). I believe this was my fourth year running this event. The course has changed slightly over the past four years ... but it has always been hot, humid and hilly. This year did not disappoint. 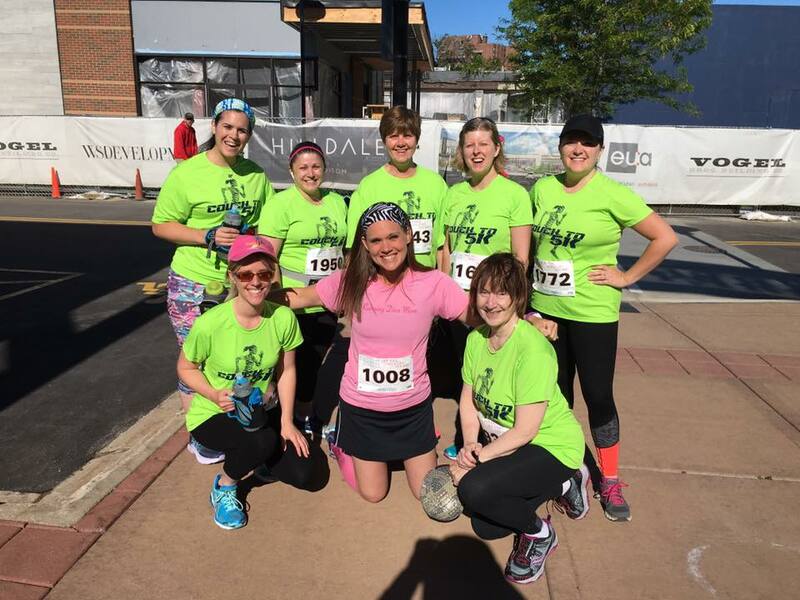 There was also a 5K, a 2 mile fun walk and a kids race associated with the ten miler. Waunafest is a fun festival that takes place in the only Waunakee in the world. It's a great family-friendly atmostphere. The festival starts and ends at the community park and there is a a nice park for the family to play at while you race and plenty of restrooms and shelters. The race started at 7:30 and I don't live too far from Waunakee. So, I set my alarm for 6am and got dressed in my cute race ensemble. I headed out solo around 6:30 and arrived way too early for the race. Packet pick up is at the Community Building and it is awesome with plenty of nice restrooms, lines aren't long and packet pickup is always a breeze. I hydrated in the Marathon Mommy Minivan, had a gel and a banana and made a few stops to the bathroom. During my last stop, I ran into Ken and Barb (I wish she went by Barbie! 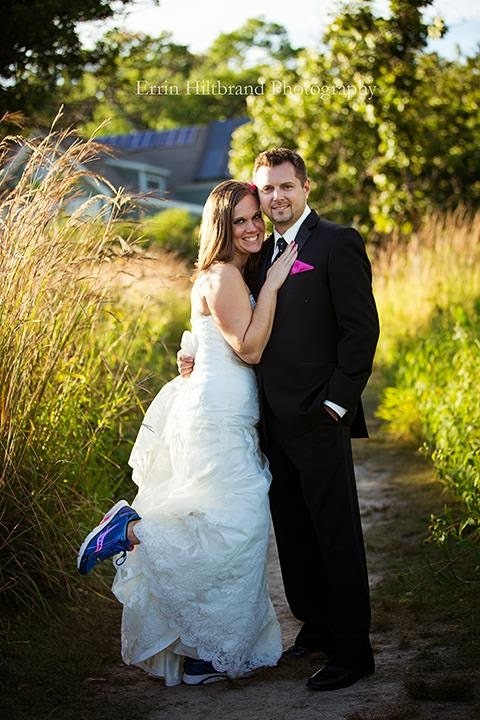 ), a sweet couple from the Couch to 5K program that I coached in the Spring. 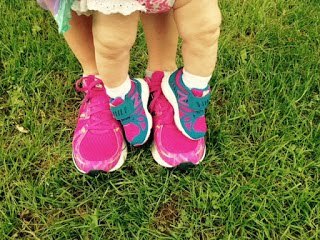 They were running their fourth 5K for the summer and said that they are running the 5K at the Madison Mini Marathon in August. 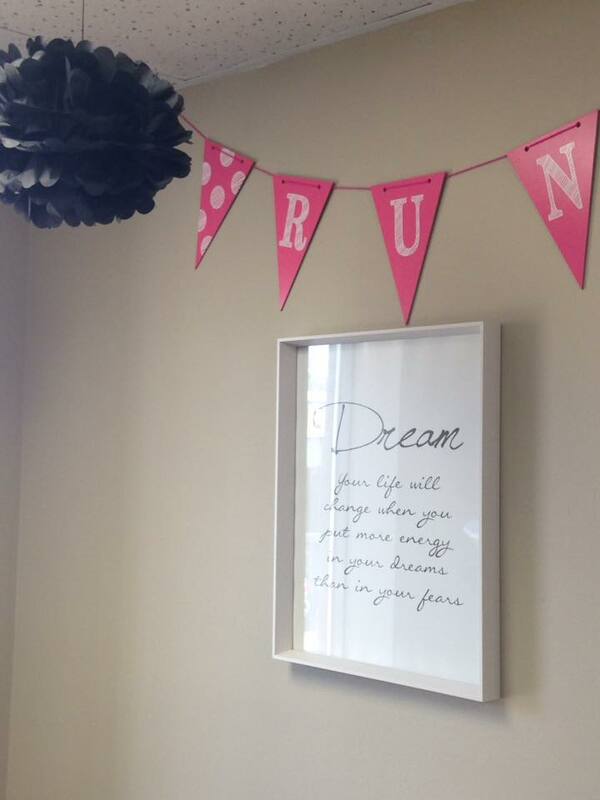 I was totally excited to hear that running has become apart of their lives as well. Totally awesome. The course was exactly the same as last year, from what I recall. Pretty hilly, pretty open, very sunny. 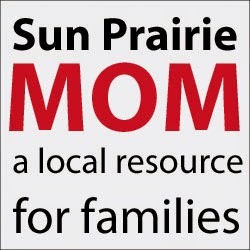 We started out through a business district that was all open with a few hills, then through a nice residential area, where many families have their own water stations and sprinklers set up. It's always refreshing and fun to see the little kids handing out water in their pj's. There were plenty of water stations out on the course, but I still always carry my handheld water with me. I like to carry my own water until I run out, but also like to store my gels and my key to my vehicle in it. I was really disappointed that there wasn't any Gatorade or drink with electrolytes in it. Just water. I rarely get thirsty during a race, and I was sweating so much that I was really feeling thirsty the second half. Gatorade or something similar would've helped me out. At about mile five, I saw my friend Tina's sister and brother-in-law at the water station cheering runners along. 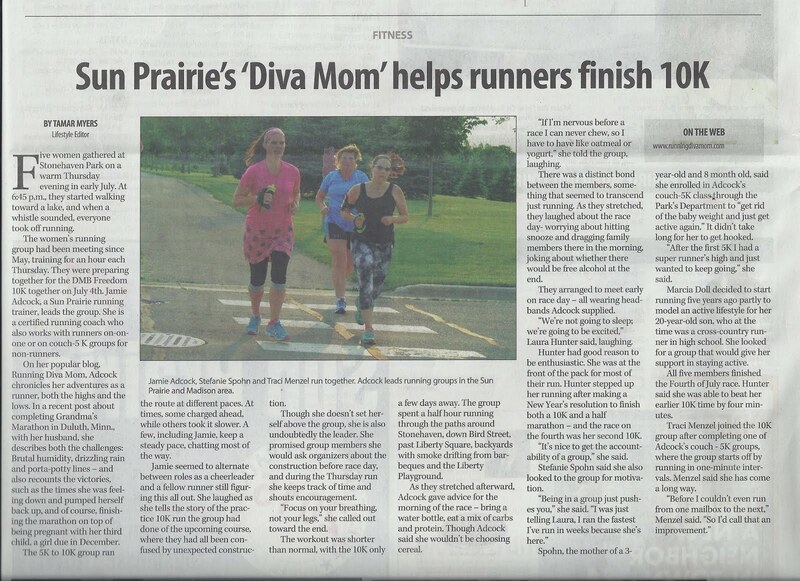 Angie said, "Go Running Diva Mom". It gave me a little extra boost to move forward. We ran through a cute bridge and another residential neighborhood. My first few miles were slow, and were only getting slower. I just wanted to finish. We then ran back through the business district and up an annoying gradual hill and past the start line, where spectators were watching the winners come in on the track. We then started the 5K route that the other runners had ran. I've always loved/hated this 5K course. It's a nice course, but totally hilly and I crash and burn on it every single time. Yet, I continue to come back! We ran through some residential neighborhoods and approached the track around the field, to the finish line. I sped up my last half of a mile and really tried to push it again. 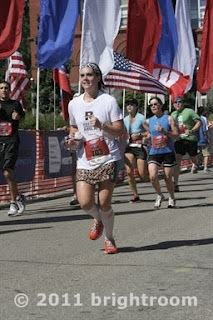 I heard my name called several times as I approached the finish line, as peeps cheered for me. It's so nice to see familiar faces out there, when my kids aren't with me on race day anymore. My time was not anywhere close to what I wanted, but I was happy nonetheless. I reunited with sweet Barb and Ken that stuck around after the 5K to watch me finish; saw Jason who I met at the event last year who recognized me from my blog; hung out with my good friend Tina and met her family and friends (many who we would be hanging out with at the festival later in the day). Just to prove how thirsty I was, I drank four bottles of water while I cooled down and chatted with everyone post-race and then downed a whole can of Diet Dew on my short drive home. I finished at 1:34 and some change, MUCH slower than my last two races ... but whatever. 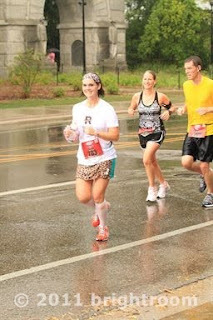 I was happy with it ... and still was smiling and having a great time when I finished. I love being able to brag and say I had a PR, but that just isn't happening for me lately. 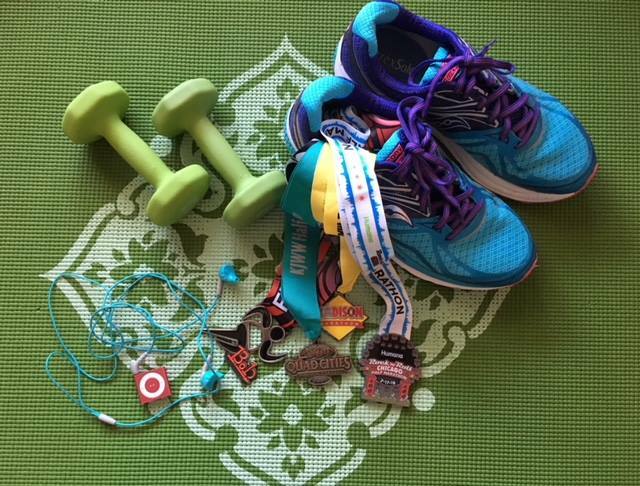 Should I refocus, adjust my training schedule, fix my diet, so that I can be faster? Maybe. 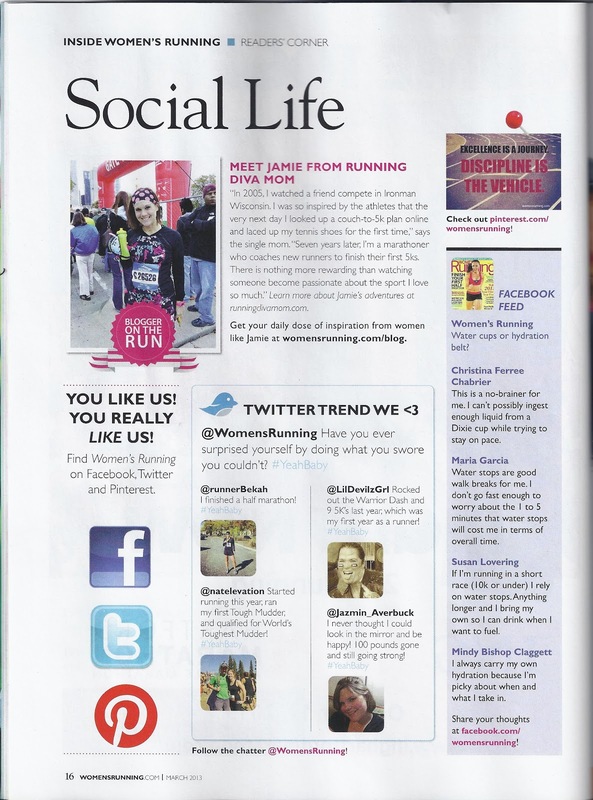 I do find that I have a good balance of fun and running lately. I'm still able to reach my mileage goals, run my events, but am not struggling to push myself and go above and beyond. I'm still loving what I'm doing. That's all that matters. I'm still consistent with everything going on in my life, and running continues to be apart of my life every single day. I still tend to run six days a week. 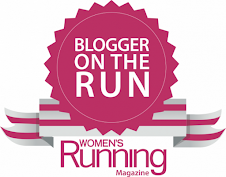 And if I only run five days, I'm still thinking about it, encouraging others to run/train, blogging about it or working on establishing a local running club when I'm not putting miles in on the pavement. I was recently given the opportunity to review HappyMelts and HappyPuffs from Happy Baby Organic Baby Food. You can read all about my fabulous experience HERE. Please visit Happy Baby online HERE and start shopping. There were 17 entries in my recent giveaway. One winner was chose at random to receive a Happy Baby Prize Pack. I was recently given the opportunity to review a custom Power Cape and Mask from Power Capes. You can read all about my fabulous experience HERE. Please visit Power Capes online HERE and start shopping. There were 47 entries in my recent giveaway. One winner was chose at random to receive a Power Cape of their choice! I was recently given the opportunity to review the "someone is reading my shirt" tee from Snorg Tees. You can read all about my fabulous experience HERE. Please visit Snorg Tees online HERE and start shopping. There were 82 entries in my recent giveaway. One winner was chose at random to receive a Snorg Tee of their choice! July was HOT, HOT, HOT. My mileage was not so much. I did reach my monthly goal of 100 miles, but again, did not exceed my expectations for the month. One afternoon, when the office closed due to a lack of air conditioning, I decided to venture out for a short run in 105 degree heat index conditions. After four stops to fill up on water and a Diet Dew, I logged 10 miles running and 5 miles walking over a three hour venture around town. Probably not the smartes thing I've ever done, but I was wise about it. 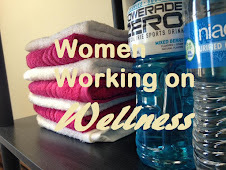 I hydrated, alternated running and walking and paid attention to my body. It was great afternoon. I ran the Waunafest 10 miler for the fourth year in a row. I didn't PR and my time wasn't fabulous, but I finished and was happy with my experience. Race report coming soon. I even ran into two of the folks I coached through the local rec program this Spring. The couple now finished their fourth 5K this summer. SUPER, amazing!! Speaking of the rec program ... 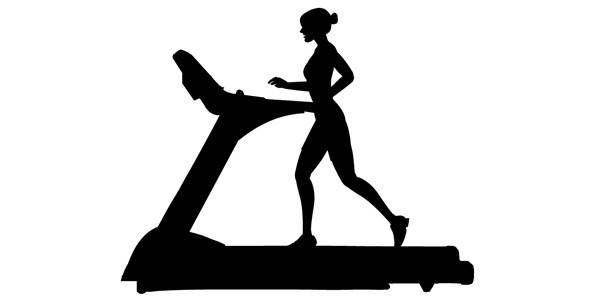 I was driving the kids to school the other morning at 6:30 am and on my way to work, I spotted another rec program participant out there, running along the highway. 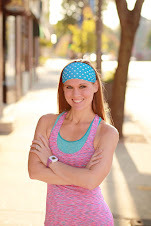 I cannot tell you how awesome it was to see how she has incorporated running into her lifestyle and kept the commitment even after the race was behind her. She was obviously up logging miles before the kids got up and before her husband went off to work. It brought tears to my eyes! I purchased some cute, new running gear with a gift card I received. These polka dot running shorts are to die for and the top is hilarious, "I make fast look good!". 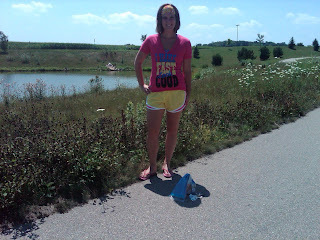 It was a little too hot Sunday afternoon, to sport this number with my hot pink compression socks!! But, they will definitely complete the outfit in the fall! Being from Wisconsin, many people think all we have here are cows and cheese ... but we also have milk! A lot of the local races now are offering yummy chocolate milk at the finish lines. It's not only a yummy afterwork treat, but it also has a lot of benefits for post-race recovery. Refuel with Chocolate Milk (HERE) recently contacted me about sponsoring me on the Refuel with Chocolate Milk team for the Madison Mini Marathon (HERE) on Saturday, August 20 in Madison, Wisconsin. 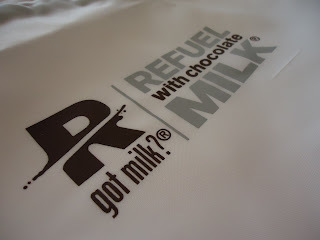 Refuel with Chocolate Milk is offering you the chance to run the Madison Mini Marathon and JOIN ME on the team! You get to run the race ... AND ... you get to wear the cool gear. There will be several members meeting up before the race and it's sure to be a blast .... and you get to refuel with chocolate milk afterwads!!! SOOOOO....what are you waiting for?!? Enter now though Thursday, August 11. I recently announced (HERE) my new RDM Cafe Press site! And, one lucky winner is winning a t-shirt of his/her choice! There are a lot of fun designs for you and your little fan club!! 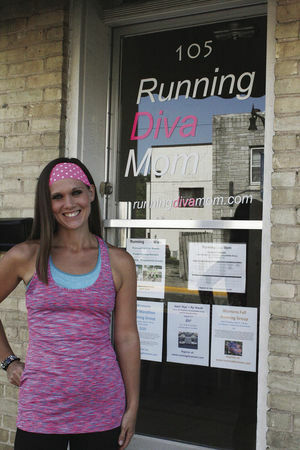 Please take a moment to check out the new Running Diva Mom Cafe Press Store (HERE). There were 74 entries in my recent giveaway for a free tee! !